Phil turned up the volume on his new audio variometer, it was getting on in the afternoon but he thought that he detected the signal he was listening for. Yes there it was, a strongly rising tone, his Nimbus Mark 3 was entering strong lift, wait another 60 seconds …… now, a steep thermal banking turn to port, the evening sun glinting along those long thin elegantly moulded wings, a little bit of elevator, not too much, this is great as Phil can now see the outer turn point for his first “Out and Return”. He knew that the club secretary would be watching him as he made the mandatory 720 degree turn over the marker. The difficult outer turn completed, Phil was worried that the lift would desert him before he managed to get back to the ridge that allowed the Nimbus to soar so far, so late in the day. The vario was not providing much assurance either, batteries probably a bit low, check the computer, seems OK, plenty of volts left yet. What’s this, we’ve got company! Keeping his distance, the young Honey Buzzard is back in formation, he is enormous, but wait a minute he is both soaring and rising! A gentle shallow bank to starboard and the Buzzard has decided to get out of the way. Buzzards are real cowards, now if he was a Peregrine he might have attacked the Nimbus by now. The audio starts up it’s encouraging rising whine, this thermal is not as strong as the last one but it might be enough to get us started on our way home. Phil could see the ridge up ahead, looming out of the evening haze. Steep mauve coloured slopes facing the prevailing South West wind coming straight off the West Dorset channel coast just a few miles away.. He knew that once he was in that lovely smooth lift he would be able to reach his objective and achieve his first out and return goal. The Nimbus quickly settled into a steady glide path as it soared over the ridge. Phil used a friendly bit of thermal assistance to assist the Nimbus across a notorious outcrop where the vario would have otherwise taken on a very low bass note as it encountered the inevitable sink in that area. Strangely, fatigue started to be felt in Phil’s legs first, but it soon disappeared as he could now see the club’s landing strip for the day and sharpened his mind for the approach pattern and landing. The last few turns had pushed the Nimbus to a great altitude, far too high to begin sorting out an approach pattern, so with a big grin Phil pushed the stick forward then smoothly back to perform a perfect large loop then up again it seemed for ever, then full left rudder to complete a satisfying stall turn. There was the car where Phil had left it earlier in the day, near as possible to the gated entrance to the landing strip. Still plenty of altitude so let’s try and perfect my Chandelles thought Phil, one was enough to have bled off enough height so downwind off the ridge, cross wind leg over the field, turning onto finals, as Phil moves the undercarriage lever and selects airbrakes. He was pleased now for that new computer system that automatically and progressively mixes the pitch as the spoilers are selected. A little more spoiler, that ridge lift must still be effective even this far back from the slope, straighten up those long elegant wings, hold off, more back pressureon the stick, the Nimbus floats on and on but as the speed bleeds off the glider gently settles into ground effect, then the first and last bump on theground as the Nimbus quivered in the red evening light, finally coming to a stop before the starboard wing tip gently dropped into the summer grass. Phil was well pleased with himself, with his glider and with his choice of equipment. A glowing feeling of satisfaction started to replace the fatigue resulting from his intense concentration. He opened the cockpit lid, switching off the radio gear as he swung the canopy open. The battery indicator showed enough battery for another two hours so he need not have worried. Phil decided to dismantle his aircraft before driving his vehicle closer, so he bent over the wings and removed the covers concealing the wing bolts, picking up one wing panel in his right hand and the fusulage in the other. Yes that’s right, Phil’s Nimbus is a quarter scale computer radio controlled model, and he has just acheived his first club out and return goal! Phil will have walked about 5 miles, encountering ground hazards such as stiles, gates and animals not to mention the usual aerial hazards of sink and turbulence. Aeromodelling has a long history and like the BGA, the BMFA (British Model Flying Association) shares it’s UK authority with the Royal Aero Club. The BMFA has 28,878 members, of which approximately 10,000 fly gliders and of these probably only about 600 fly scale radio controlled sailplane models of both modern and vintage prototypes. Large quarter or one third scale model sailplane flying like most sports, can be as cheap or as expensive as the aeromodeller wants to make it. Phil’s Nimbus will have cost him between £1500 to £2000 for the high quality German epoxy and carbon fibre mouldings and fittings to finish the machine. A radio receiver, batteries and the seven servo’s needed to control the glider together with the state of the art programmable transmitter will add a further £1400. Add another £400 for the audio variometer telemetry system and the total cost soon starts to escalate but the same transmitter can be used for 99 different models! Those that prefer flying models of vintage gliders can produce a machine at very much reduced costs at the expense of many hundred’s of hours in their workshop. Non computer radio or used radio equipment also substantially reduces the cost. Most full size pilots who try flying a radio controlled model agree that it tends to be more difficult at first, especially when the machine is coming towards you! It is easy to become dis-orientated so experienced model pilots intuitively “think” from the cockpit of the model, which then ensures that the correct control input is made, most of the time anyway! 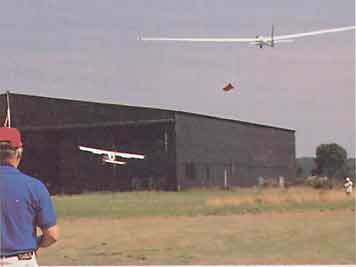 The largest model soaring club is based at Dunstable and uses the Ivinghoe hills for ridge soaring, sometimes sharing air space with full size gliders from the London Gliding Club nearby. 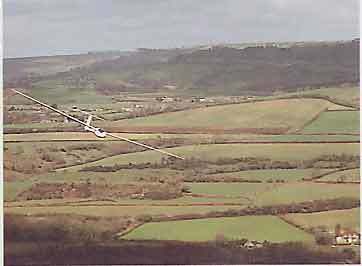 The second largest club is the Meon Valley Soaring Club who use the slopes of Butser Hill. The only club in the UK solely dedicated to radio controlled scale model flying is the Southampton Soaring Society, who tend to fly the excellent ridges of West Dorset but also aerotow using the club’s quarter scale Piper Cub and PZL Wilga as tugs. Aerotowing model sailplanes with model powered aircraft is extremely successful and very satisfying for both the tug and glider pilots. The Southampton club put on a very successful model aerotow event at Lasham last year and this event will be held again as an International event in September this year. The club is also invited to take part in the flying celebrations marking the 50th anniversary of Lasham Gliding Centre in June 2000.